With the upcoming French Presidential election in France the topic of Islam in Europe has again become central to the political discourse. This is nothing new: we also saw that in the UK, in Holland, in Austria and even in Switzerland, where the Muslim communities were banned – by popular referendum – from building minarets (even though only four minarets existed in Switzerland before that referendum). Tensions between Muslims and non-Muslims are clearly on the rise, not only due to some more or less racist or anti-immigrant feelings in the general population, but also due to the often appalling behavior of some refugees from Muslim countries (assaults, rapes, hooliganism) and even some Muslim communities in Europe (advocacy for terrorism, attempts to impose Sharia law). Before the situation gets better (assuming it ever will), it will most likely get worse, much worse. First, let’s agree with Otto von Bismark’s wise words that “politics is the art of the possible“. Those Europeans who think that they will simply expel all Muslims from Europe or somehow manage to eliminate Islam from Europe are deluded. Likewise, those (rather few) Muslims who want to create some kind of Caliphate in Europe are no less deluded. In fact, all those who offer simple, straightforward “solutions” to the current crisis would be well advised to study some Hegelian dialectics to understand that the outcome of this crisis will not be the return to a status quo ante or the creation of an absolutely new reality. Second, I submit that neither Muslim immigrants nor Islam itself will ever leave Europe: like it or not, they are here to stay. Why? Simply because while some groups, such as illegal immigrants, can be expelled from a country or even from the European continent, others, such as Muslims holding European citizenships or local/native converts to Islam are simply not expellable: this is impossible legally, and this is impossible practically (expel where? how?). I have personally worked in refugee centers in Switzerland (as a translator and interpreter) and I have worked as an analyst for the Swiss General Staff where the issue of refugees was often front and center, and I can promise you that anybody who really knows how the system works also fully realizes that most of these immigrants are here to stay, even the pseudo-political refugees who are, in reality, economic immigrants and not political refugees at all (about 99% of so-called “political refugees”). At best, the EU could, in theory and with an immense effort, close its borders to future immigrants. Not likely, but at least possible. But mass expulsions are simply not an option. Third, those Muslims who are already in Europe will inevitably climb the social ladder even if right now they are at the bottom. Many of them are young, many of them have suffered hardships which most Europeans could never overcome. Their family, tribal, ethnic and religious ties are much stronger than the ones you can observe in the modern “nuclear” family of most Europeans. Last, but not least, their social drive is much stronger than the one found in “established” Europeans circles. So even if the current generation is poorly educated and not integrated in the European society, the next one will be. I have seen that with many other economic migrants such as Italians or Albanians. So when you see that Iraqi women sweeping the floors of your local hospital, remember that, in ten years or so, her daughter will likely work at the same hospital, but as the medical doctor. In other words, the social power of the Muslim community will inevitably grow. Does that mean that the EU will become ISIS-occupied territory where all women will end up wearing burkas and/or raped, all men forced to converted to Islam or murdered, that slave markets will spring up all over the country, that Sharia law will be imposed on everybody, and that homosexuals will be stoned to death? Of course not! This is a silly caricature of Islam created and promoted by the AngloZionist 1%ers who run the Empire and who are trying to artificially create a clash of civilization which would allow them to remain in power and to continue pulling the strings from behind the scenes. For one thing, Muslims will remain a rather small minority in Europe for the foreseeable future. But even more importantly, the kind of “Hollywood ISIS-Islam” which I portrayed in the paragraph above is not at all the kind of Islam most Muslims want to live in. In fact, many of them fled their own country precisely to avoid living in a Takfiri “Caliphate”. You might ask me about those Wahabi crazies who have already murdered many Europeans with screams of “Allahu Akbar” on their lips. Aren’t they bona fide ISIS-types? Well, that is a complicated issue. For example, did you notice the vast majority of these so-called “Islamic” crazies had strong ties to the European security services? That some of them even had traveled to Israel? Doesn’t it seem strange to you that their attacks somehow always seem to be scheduled to coincide with important political events in Europe? Could there have been a genuine ISIS attack in Europe? Yes. But I am pretty sure that most of them were Gladio-style false flags executed by EU or US special services. I will readily agree that there are real and dangerous al-Qaeda/ISIS types in Europe right now. Yes, they do represent a real risk. But unlike most refugees, these guys do violate European laws and legal action can be taken against them. In theory, Europe could even re-introduce the death penalty for terrorism or even for apology of terrorism. I know, that ain’t happening anytime soon, but what matters is that this will depend on a political decision, the political will of the Europeans. No so for mass expulsions which are impossible regardless of any political decision or will. Could there be an uprising or even a civil war in Europe? Yes, but only as long as the governments in power have a vested interest at letting one happen or creating one. As soon as the national authorities give the security forces and the military the green light to intervene and suppress the insurrection it’s “game over” for the al-Qaeda types. So while Islam per se or Muslims in general are not expellable from Europe, the Europan nations will be able to deal with the security situation provided there is a political will to do so. Those who think that any criticism of Muslims is “Islamophobic”. Those who think that all Muslims and Islam are bad, bad, bad, bad. These are very primitive and fundamentally misguided positions. More importantly, both of these beliefs are bound to result in failure to achieve anything. For the time being, many Europeans and Americans appear to be stuck in this false choice, but no matter how long it takes reality will eventually catch up with them and they will realize that there is no such thing as one “Islam” or a single type of “Muslim”. The truth is that the world of Islam is extremely diverse and that all of the ingredients needed for a complete defeat of Takfiris (whether of the al-Qaeda, ISIS, al-Nusra or any other kind) can be found inside Islam. In fact, they can only be found inside Islam. Let me illustrate my point by making a simple comparison between Russia and the EU. Unlike the EU, Russia has one single central government, and a strong one at that. The Russian intelligence and security services are amongst the best on the planet, as it the Russian military. Russia does not suffer from the disease of political-correctness: it is totally acceptable in Russia to denounce Islamic terrorism in the harshest possible terms. In fact, Putin even made a famous statement about “offing the terrorists in the toilets if needed” and the Russians did exactly that: they killed every single Chechen Wahabi leader and, far from denying it, they proudly proclaimed it. The key difference with the EU is that Putin and the Russian people had the political will to stop the insurgency in Chechnia, even if that meant turning all of Chechnia into a pile of smoking rubble. Yet, at the same time, Putin made major efforts to support the Muslim community in Russia. Not only did he built a huge (and beautiful) mosque in Moscow, he has embarked on major program to support the growth of traditional Islam in Russia (just as he has done with the Orthodox Church). As for Chechnia, Putin has made Ramzan Kadyrov something of a “political son” and has given the Chechens an extremely wide autonomy, especially in matters of religion. So is Putin anti-Muslim or pro-Muslim? Neither. Putin understands a simple thing which, so far, totally eludes western politicians: Russians are very good at killing Takfiris, but only Muslims can kill Takfirism. The threat has never been Islam. The threat is Takfirism. Here is how Wikipedia defines the concept of “Takfir”: In Islamic law, takfir or takfeer (Arabic: تكفير‎‎ takfīr) refers to the practice of excommunication, one Muslim declaring another Muslim as kafir (non-believer). Please read this again carefully. The practice of declaring “another Muslim” as a non-believer. Another Muslim. So the key characteristic of Takfiris is that they believe that all those who do not follow their version of Islam are not even Muslims. How do you think that this makes these other Muslims feel about the Takfiris? Actually, there is nothing wrong in theological terms with the notion of “Takfir” just as there is nothing wrong with the notion of “excommunication” or, for that matter, “anathema” or “heretic”. These are categories which, when properly used, are indispensable for specific types of theological arguments. However, just as “excommunicate”, “anathema” or “heretic” can be used by some only as insults, slander or even calls to murder, “Takfirism” is first and foremost a mindset. Guns and bullets cannot defeat a mindset. In fact, only ideas can defeat other ideas. The Russians know that. There are several videos on YouTube (alas, in Russian) which show Chechen leader Ramzan Kadyrov coming to the location of a battle with Chechen extremists and engaging the terrorists in a theological dispute about Islam. Instead of just ordering his troops to kill them all, he challenges them by asking them “so you think that you are Muslims and we are not?” or “how is our society not Islamic?”. And his favorite one “if you can find a single quote in the Quran proving to me that what I do is not Islamic then I will immediately cease doing it”. This does not always work. Some refuse to surrender and they are all inevitably killed (there is zero tolerance for Takfiris in Chechnia). But frequently this does work. Terrorists lay down their weapons, come out and instead of being abused and jailed or simply shot, they are sent to special prisons where Islamic preachers come and spend long hours teaching them about true Islam. And more often than not, when these young men come out they become volunteers for the Chechen security forces! Now I ask you – could an Orthodox Christian or an agnostic achieve the same result? Never, of course. So this is why the non-Muslim security forces, while still present in and around Chechnia, are always kept in a reserve and support role. The primary task to police Chechnia is fully entrusted to the Chechens themselves. There are always powerful Russian forces on high alert ready to intervene should the situation suddenly get out of control, but by now the real battle is not fought with guns, it is fought with ideas and, as Putin as said it many times, only real, traditional Islam, can defeat Takfirism. Right now, most western politicians simply don’t get it. Or, if they do, they don’t dare say it. But sooner or later the Europeans will have to come to that absolutely inevitable conclusion. And when that happens, they will finally realize that Islam and the Muslims who practice is never the enemy. The enemy is a relatively small sect of para-Islamic crazies which originated in the 13th century and which remained largely in the fringes of the Islamic world until it was given an immense boost first by the House of Saud and, later, by the US CIA. Today, the Takfiris are still the instrument of the AngloZionist Empire, they are the infection which is unleashed against any country daring to reject the Empire’s dominion. Furthermore, the Takfiris are, first and foremost, a threat to any and all other variants of Islam, whether Shia or Sunni. In conclusion – a beautiful image and a symbol. It shows the “Kremlin” (traditional Russian fortress) in the city of Kazan. Notice how the Orthodox churches and the mosque beautifully blend together? Is this not a serene and peaceful? Now please take a quick look at the history of Kazan as outlined in Wikipedia. 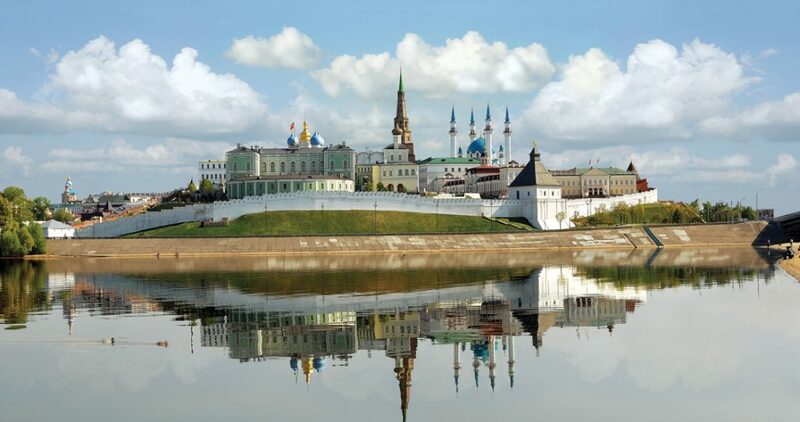 Kazan was a city where Christians and Muslim viciously persecuted each other, both sides practiced forced conversions and both sides engaged in full-scale massacres. In recent times, following the break-up of the Soviet Union, things almost got ugly again, there was a short-lived but very vocal local separatist movement. Then cool heads prevailed. But the fact is that the history of Kazan is hardly idyllic and that a lot of innocent blood has been shed here. The point here is that after centuries of warfare both Muslims and Orthodox Christians have learned how to coexist in peace and even create something truly beautiful, like this Kremlin, together. This would not have been possible with the Takfiris, the hateful and insane monsters who took pride in destroying the beautiful Syrian city of Palmyra. For them there is nothing beautiful in the photo above, it is a blasphemy. Should they ever seize power in Kazan, they would definitely destroy it all, including the mosque. The lesson here is simple: first, former enemies do sometimes become friends and allies and, second, the churches and mosque of the Kazan Kremlin protect each other and make this Kremlin far stronger than if only one of the two buildings was standing inside its walls. Mosques are here to stay in Europe too, and the short-sighted who don’t know history will view this as the end of their civilization and they are the ones who, without ever realizing it, will uselessly delay the eventual defeat of Takfirism in Europe and elsewhere. Those who do understand the real dynamics at play will see this as something very different: a chance at rebirth and a fantastic opportunity to truly crush Takfirism both at home and abroad. Right now Putin’s Russia is the example of how “it is done”. But the West it too busy demonizing everything “Putin” and supporting anything russophobic, such as the Nazis in the Ukraine, that it simply cannot follow this example. But maybe a new generation of European politicians will.